I played another couple of games of Dark Gothic, the Spooky Hollow deck-building game. 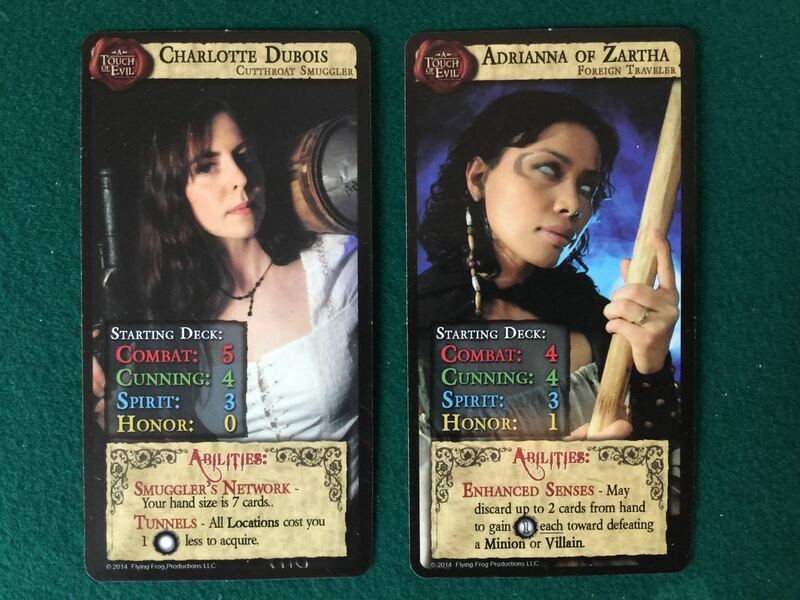 This time I played with two random heroes and drew Charlotte Dubois the cutthroat smuggler, and Adrianna of Zartha the foreign traveler. Charlotte’s main ability is that she draws seven cards each turn. This is a very powerful ability as you always want more points and so every card counts. Adrianna has a neat ability in that she can convert up to two cards a turn into silver resources, which can be any colour. This is great early on, but less useful later when many of your cards are worth two or three points on their own. Also it only applies to fights. Posted in Blog Posts and tagged Dark Gothic, Deck-building on April 5, 2015 by Tim. I got around to playing a couple of games of Dark Gothic, the Touch of Evil deckbuilding game. I haven’t played much in the way of deck-building games, except Thunderstone which I quite liked although it was a bit fiddly. I do like the theme of this one. I played two heroes in the competitive mode to start with and to get the hang of the rules. In the first game I payed the scientist and the smuggler, and in the second I played the monk and the noblewoman. Posted in Blog Posts and tagged Dark Gothic, Deck-building on February 24, 2015 by Tim. We visited Sci Fi City while we are here in Orlando. We almost missed it because they had moved across to the other side of the shopping estate sometime in 2013 and when we arrived we thought they had closed down. Luckily I spotted their sign on the other side of the car park. We bought a bunch of stuff, one item of which was Dark Gothic, a card game from Flying Frog, and based on their earlier game A Touch of Evil (the Spooky Hollow game). This is a deck-building card game using all the same illustrations, which is nice. Posted in Blog Posts and tagged Dark Gothic, Unboxing on January 27, 2015 by Tim.